Have your painting or giclee canvas stretched by an expert. We custom make all stretcher bars from stock that is specifically made for canvas stretching. The stock is made of finger jointed pine to reduce warping or bending. It also has a lip on the outer edge to keep the back of the painting off of the wood bars for conservation purposes. We use only stainless steel upholstery staples for a strong, long-lasting hold. There are different types and sizes of stretcher bars. 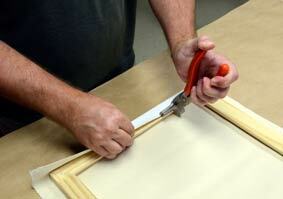 Narrow stretcher bars are used when you will be capping the canvas with a frame. Thicker bars (1” and deeper) are used when the outside edge and sides will be visible with either a solid color, painted or a continuation of the image. This stretching process is called “Gallery Wrap” or “Museum Wrap.” No framing is required to have this as a finished product. You may choose to complete your Gallery or Museum wrapped canvas with a “Float Frame.” These frames are designed to have the artwork attached to give the appearance of floating inside the frame. Canvas stretching pricing is calculated based on a United Inch total. United inches are totaled by adding the length plus the width of the finished canvas. The cost includes custom made stretcher frame and labor. We can custom build and stretch blank canvases for you to paint yourself.